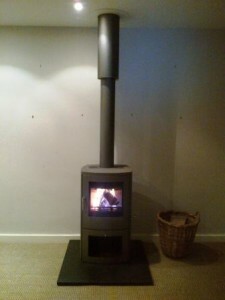 Chesney’s Milan Stove is a great choice of stove for a contemporary setting. Its sleek cylindrical lines let it stand within a room and provide an attractive and highly effective source of heat. Moreover, the Milan wood burning stove is DEFRA exempt for use in smoke control areas which means it can be safely and legally used to burn logs in all major cities and towns throughout the UK. It also comes in a range of colours; black, sage green, atlantic blue, parchment and silver. Finally, if you’re thinking of having a wood burning stove fitted in your home, contact us and we will happily advise you on which wood burner would suit your requirements best.